Paris is a top destination for cooks of all stripes, from amateurs looking to improve the dishes they serve to family and friends right up to professional chefs seeking top-notch instruction and unparalleled kitchen experience. From the world-famous Le Cordon Bleu cooking school to some of the best kitchen supply shops on the planet, Paris is ground zero for the culinary arts. There are plenty of these fantastic boutiques where cooks can stock up on top-quality supplies and kitchenware, from the copper pots and pans sold at E. Dehillerin to hard-to-find ingredients at the beloved G. Detou. This large shop in the Les Halles district is crammed top to bottom with more than 5,000 items (all of which also can be purchased online) to meet just about every culinary need, from pots and pans to kitchen machines to tableware and silverware to even cleaning and disinfecting products. 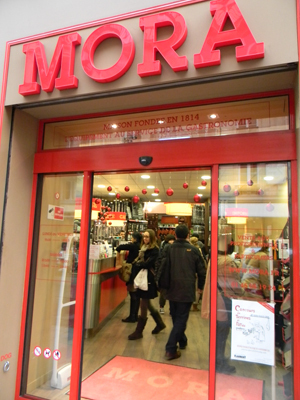 And many Parisians and tourists do, indeed, head to Mora for all of their cooking needs. But Mora is absolute heaven on earth for pastry chefs and bread makers, offering more specialty items for these cooks than any other shop in the City of Light—and quite possibly in the entire world. American pastry chef and cookbook writer David Lebovitz, who has widely chronicled his experiences as an ex-pat in the City of Light through his books and his blog at www.davidlebovitz.com, is one of the many to heap praise on Mora. “Pastry chefs come from all over the world to visit Mora, which has a great selection of tart and cake molds, whisks and spatulas, and just about everything else. Plus the best selection of chocolate molds in Paris,” he enthuses. And he’s not exaggerating. After venturing through the usually thronged front display room, visitors find a second space where seemingly every available inch is filled with supplies designed to meet every need of patissiers and boulangers. Silicon baking sheets and trays? Check. 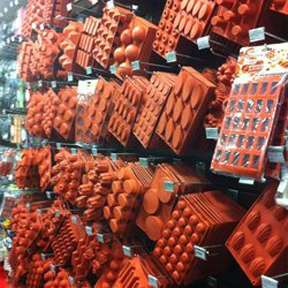 Chocolate molds? Dozens. Tart pans? Every shape and size you can imagine. Cake decorations? Scads of them. Candy-making equipment? Of course. From basic gadgets like candy thermometers, rolling pins and whisks right up to such specialized products as edible inks and colorful transfer sheets used to decorate chocolates, there’s nothing a pastry chef or bread maker could ever want that’s not carried by Mora. The collection is simply unparalleled. If you’re a candy maker, bread baker or pastry cook and you’re in the City of Light, you owe it to yourself to head straight to Mora. You might also want to bring an empty suitcase for all the items you end up purchasing! And if you aren’t fortunate enough to have an upcoming trip to Paris planned, visit the shop’s website at www.mora.fr, where you can buy any product that’s available in the boutique. 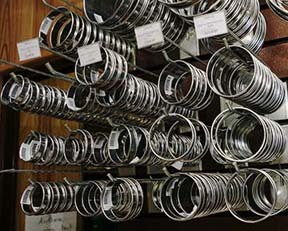 In addition to bread and pastry making supplies, Mora sells items in the following categories: Cuisine (cookware), Arts de la Table (tableware and serving equipment), Coutellerie Taillanderie (cutlery), Appareils et Machines (appliances), Manutention et Stockage (handling and storage), Textile (kitchen clothing), Hygien Entretien (cleaning and maintenance), Decors Etalage (displays), Aromes et Colorants (scents and coloring agents), Librarie (books, mostly cookbooks) and Usage Unique (basically anything that doesn’t fit into the other categories. Hours: Monday-Friday, 9 a.m.-6:15 p.m., Saturday 10 a.m.-1 p.m. and 1:45-6:30 p.m. Closed Sunday. This entry was posted in Boulangeries, Chocolatiers, Culinary Supplies, French cuisine, Les Halles, Patisseries, Shopping and tagged bread maker, candy maker, E Dehillerin, G. Detou, Mora, pastry chef by Bob Adams. Bookmark the permalink.